Militants are equipping fortifications in residential areas. 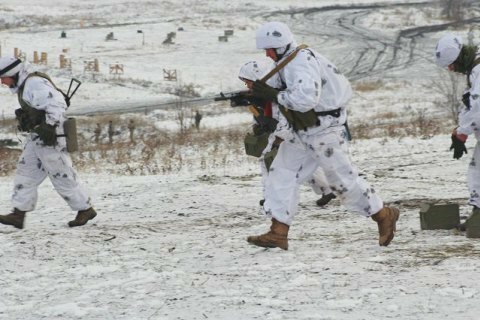 On Christmas Eve, 6 January, the enemy continued to target positions of the Ukrainian Armed Forces with weapons banned by the Minsk agreements, the antiterrorist operation (ATO) HQ has said. One Ukrainian serviceman was wounded as a result of three ceasefire violations by pro-Russian militants registered on 6 January. In the Luhansk sector, militants fired over 10 bombs from 120-mm mortars near Troyitske. They used small arms near Stanytsya Luhanska and small arms and heavy machine guns around Novoluhanske in the daytime. Ukrainian servicemen did not return fire. In a later update, the ATO HQ press centre said that Luhansk and Donetsk militants used the New Year-Christmas ceasefire to mend their firing positions and equip the new ones. Their fortifications and military hardware are located in population centres or directly close to civilian houses in the areas currently outside of government control. Some of their positions are in Kalmiuske (previously Komsomolske, 42 km southeast of Donetsk), Styla (Donetsk Region) and Kalynove-Borshchevate (Luhansk Region). According to Ukrainian representatives in the Joint Centre for Control and Coordination of Ceasefire, the militants' actions show that they do not care about the local population and are once again going to use them as a "living" shield. "Despite its might, Russian influence on Belarus is decreasing"
Consul dismisses Polish remarks about "thousands of Ukrainian refugees"